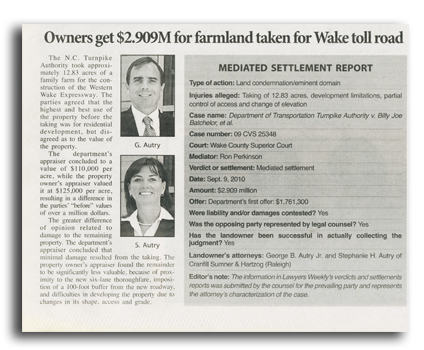 The N.C. Turnpike Authority took approximately 12.83 acres of a family farm for the construction of the Western Wake Expressway. The parties agreed that the highest and best use of the property before the taking was for residential development, but disagreed as to the value of the property. The department’s appraiser concluded to a value of $110,000 per acre, while the property owner’s appraiser valued it at $125,000 per acre, resulting in a difference in the parties’ “before” values of over a million dollars. The greater difference of opinion related to damage to the remaining property. The department’s appraiser concluded that minimal damage resulted from the taking. The property owner’s appraiser found the remainder to be significantly less valuable, because of proximity to the new six-lane thoroughfare, imposition of a 100-foot buffer from the new roadway, and difficulties in developing the property due to changes in its shape, access and grade. Case name: Department of Transportation Turnpike Authority v. Billy Joe Batchelor, et aI. The information in Lawyers Weekly’s verdicts and settlements reports was submitted by the counsel for the prevailing party and represents the attorney’s characterization of the case.